The Binquirer, August 1: Waid and Yu on Hulk, Wes Craven's Coming of Rage, Alan Moore's Unearthing, and much more! As Comic-Con 2008 set records for attendance this summer, much of the “buzz” centered on Zack Snyder’s eagerly anticipated, big screen adaptation of the Hugo Award-winning cult classic graphic novel “ Watchmen,” authored by legendary comic book writer Alan Moore. Now, in the first and only documentary in which the heretofore reclusive, visionary and innovative Moore participates, his hugely-devoted fan base and the soon-to-be-indoctrinated can enter the mind of the world’s most famous comic book author, embarking on a fascinating and psychedelic journey through the life and career of the creator of “ Watchmen,” “ From Hell,” “ League of Extraordinary Gentlemen,” “ Constantine” and “V for Vendetta.” THE MINDSCAPE OF ALAN MOORE makes its DVD debut on September 30, only from The Disinformation Company. Moore – writer, artist and performer – is the arguably the world’s most critically acclaimed and widely admired creator of comic books and graphic novels, a true original responsible for many of the genre’s iconic creations. 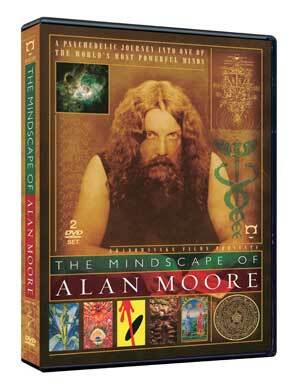 In THE MINDSCAPE OF ALAN MOORE, viewers are granted a portrait of the artist as contemporary shaman -- someone with the power to transform consciousness by means of manipulating language, symbols and images. The award-winning film, from director DeZ Vylenz, leads the audience through Moore ’s world with the writer himself as guide, beginning with his childhood background, following the evolution of his career as he transformed the comics medium, through to his immersion in a magical worldview where science, spirituality and society are part of the same universe. Recipient of the Special Recognition Award for Creative Achievement in Documentary Filmmaking at the San Francisco World Film Festival, THE MINDSCAPE OF ALAN MOORE has also been featured at film festivals worldwide including Comica at the ICA Cinema London, Copenhagen International Film Festival, Belfast International Film Festival, San Diego Comic-Con Film Fest, Comicdom Con Athens and Caption Oxford. As excitement continues to build for “Watchmen” (scheduled for release in March ’09) – the publisher just put an additional 300,00 copies in print following the release of the trailer and Comic-Con – get an inside glimpse inside the psychedelic worldview of one of the world’s most visionary and creative minds with THE MINDSCAPE OF ALAN MOORE. The Disinformation Company Ltd. is active in TV production, book publishing and home entertainment. It is most widely recognized for its distribution of products on subjects not usually covered by the traditional media. Recent DVD exclusives from The Disinformation Company include the best-selling Robert Greenwald documentaries Wal-Mart: The High Cost of Low Price, Outfoxed: Rupert Murdoch's War on Journalism, Uncovered: The Whole Truth About the Iraq War, and Unconstitutional: The War on our Civil Liberties, as well as Robert Baer’s The Cult of the Suicide Bomber, and Greg Palast’s Bush Family Fortunes.